We got our visas for China. Yay. When is Chinese New Year this year anyway? We've been busy. Went bowling last Friday. My first frame was a strike. I won that game with 124. The second game I don't think I broke 80. Talent I have not, just a little luck. Sometimes. 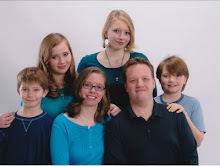 We had family portraits done on Sunday with the 8 of us. Monday we spent 5 hours at the Tysons mall. Tuesday an old high school friend came over for a bit with her husband and 3 year old. Last night we went to the warehouse store and bought 200lbs of cat litter and a big pack of Sharpies. I *heart* Sharpies. Today we're visiting an old friend of the family who lives in the neighborhood, then going back down to Woodbridge to lament the fact that houses are really affordable down there but it's so far away from DC. No actually we're going down to pick up something and swing through Potomac Mills Sports Authority for tennis supplies, but lamenting will happen on the side. As will a stop in Chik-Fil-A. Katherine is plugging away on her math work, they are all continuing with piano and/or flute. This weekend Ian and I will be gone for a few days so my parents have run of the kids. Say a little prayer for them.